The Washington Monument was completed in 1884, 101 years after Congress authorized it. It rises in a straight line between the Capitol and the Lincoln Memorial, but is off-center between the White House and the Jefferson Memorial because the original site was too marshy for its bulk. Private funding ran out in the 1850s, when only the stump of the obelisk had been erected. Building resumed in 1876, producing a slight change in the color of the marble about a third of the way up. The 555ft monument—the tallest free-standing masonry structure in the world—was capped with solid aluminium, then a rare material. South of the monument, a cast-iron plate near the light box conceals an underground 162in miniature of the monument, measuring the rate at which the big version is sinking into the ground: around a quarter of an inch every 30 years. 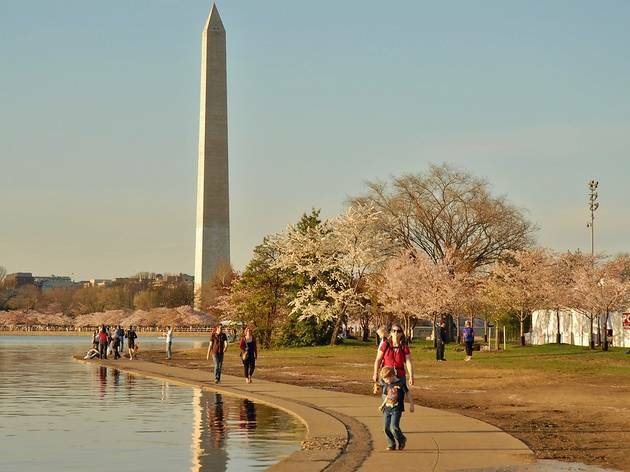 For the past two years the Washington Monument has been closed for repairs—following earthquake damage in August 2011. 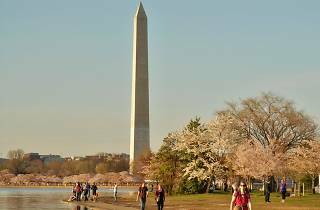 The scaffolding has now come down and the obelisk is due to reopen to the public on May 12 2014, when timed tickets for same-day visits will be available for free from the 15th Street kiosk (opens 8.30am). During summer, lines can form by 7am. You will also be able to reserve tickets at www.recreation.gov, or by calling 1-877 444 6777. There is a $1.50 service charge per ticket.